Lazurite is a tectosilicate mineral with sulfate, sulfur and chloride with formula: (Na, Ca)8[(S, Cl, SO4, OH)2|(Al6Si6O24)]. It is fairly complex as minerals go, combining aluminum silicates with sodium, calcium, sulfur, chlorine and sulfates. The result is a rich, brilliant blue color. It is a feldspathoid and a member of the sodalite group. Lazurite crystallizes in the isometric system although well-formed crystals are rare. It is usually massive and forms the bulk of the gemstone lapis lazuli. Lazurite is the blue component of the ‘gemstone’ (or, more usually, decorative rock) Lapis Lazuli, which is a lazurite-calcite-pyrite rock that has been mined as a gem material for some 9,000 years. Color: Deep blue, azure, violet-blue, greenish blue. Lazurite is a deep blue to greenish blue. The color is due to the presence of S–3 anions. It has a Mohs hardness of 5.0 to 5.5 and a specific gravity of 2.4. Other blue minerals such as the carbonate azurite and the phosphate lazulite may be confused with lazurite, but are easily distinguished with careful examination. Lazurite at one time was used as a synonym for azurite. Lazurite is named after Latin “lazulum” or Persian “lazhward” – blue, alluding to its color. It can be found as well-formed crystals of deep blue color. But it is more frequent in its massive form as the main component of Lapis Lazuli. 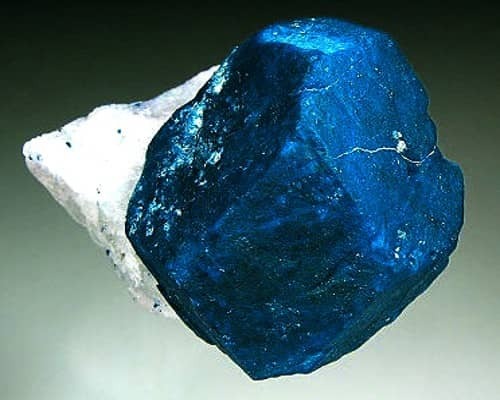 Lazurite occurs almost exclusively in massive form without any visible crystals. 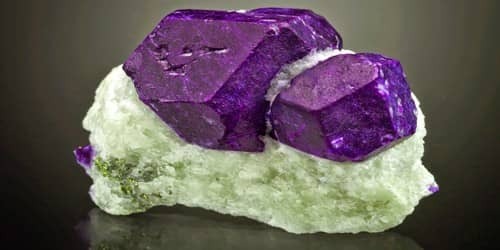 The exception is the historic occurrence of Afghanistan, where this mineral is famous and highly regarded for producing outstanding rich-blue crystals, unlike any other minerals. Lazurite was first described in 1890 for an occurrence in the Sar-e-Sang District, Koksha Valley, Badakhshan Province, Afghanistan. It has been used as a pigment in painting and cloth dyeing since at least the sixth or seventh century CE. It is also mined at Lake Baikal in Siberia; Mount Vesuvius; Burma; Canada; and the United States. The name is from the Persian lazward for blue.